All guests before 8:30pm must bring food to share – group preparations are okay! Admission includes complimentary beer, wine, cocktails, and non-alcoholic choices. Schedule: Doors 6:30pm | Potluck 7:00pm | Slideshows 9:00pm | After Party to Follow! SLIDELUCK Seattle is a massive digitally projected slideshow and a potluck dinner with hundreds of amazing people. 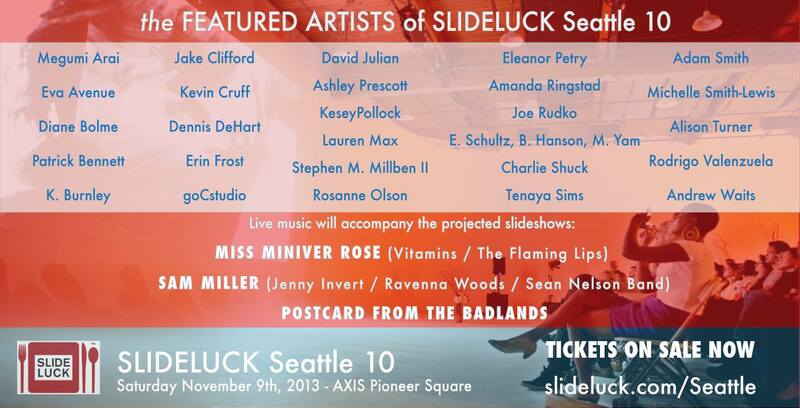 It’s taking place on Saturday, November 9th 2013 at AXIS Studios Pioneer Square (former home to Elliott Bay Book Co.). It’s beautiful, 6000 square feet and brand spankin’ new. The theme of this year’s event is ”One Hundred and Fifty Miles”. Our goal is to have every single element that it takes to produce SLIDELUCK Seattle 10 come from, or utilize resources from within 150 miles of Seattle. That includes the art that is created, the food that people bring to the event, the Sponsors that support us, and even the plates and utensils that we use to enjoy all the incredible food. The goal of SLIDELUCK is to bring together diverse groups of people, artwork, food, ideas and perspectives under one roof. From this diversity something unique and magical is born. The work of established artists is shown alongside that of emerging and non-professionals, sowing fertile ground for creative growth within the local visual arts community. These beautifully produced exhibitions create a forum for exposing the general public and professionals in the arts community to new work. On an global level, past participants have included; Elliott Erwitt, Alec Soth, Gregory Crewdson, Chris Buck, Shepard Fairey, Martin Schoeller, Vincent LaForet, Spencer Tunick, Chuck Close and Nadav Kander. SLIDELUCK is a 501c3 non-profit organization dedicated to building and strengthening our city through food and art. We host multimedia slideshows combined with potluck dinners in a festive and celebratory environment. In August 2012, SLIDELUCK Seattle 9 brought together more than 450 of Seattle’s most creative and food conscience community for an evening of unforgettable experiences. Want to Sponsor or Volunteer – email us seattle@slideluck.com.